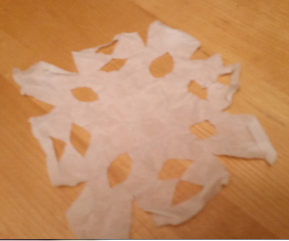 But how should I proceed in order to get a snowflake pattern, for instance, or other specific design using the above similar frosting technique? Is this possible? Use a sponge and cut it to shape. Loved an excuse for a quick experiment. 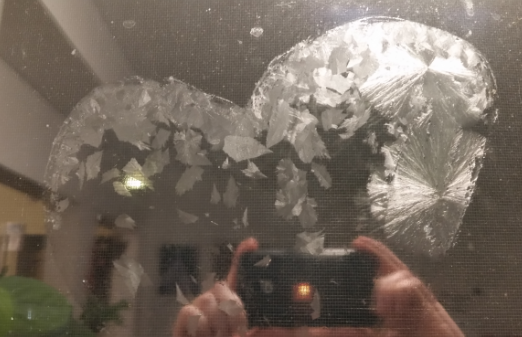 So, the patterns in the video are made from an Epson salt solution with the following ingredients per the linked video. I tried a few different techniques to make specific patterns. The basic idea is to control the amount of liquid applied. Too much and it will bleed and drip down. So I wanted to try something that would hold liquid and not tear easily after it was cut. Most common napkins are frail so I used a heavier duty one. Any absorbent cloth would work but napkins are easier to come by. This didn't turn out quite good at all. It was hard to get the right amount of liquid applied and keep the detail. Only my first attempt mind you. Read onto sponge for and improved version of what I was trying for here. This is where I think you will get the most out of this project. 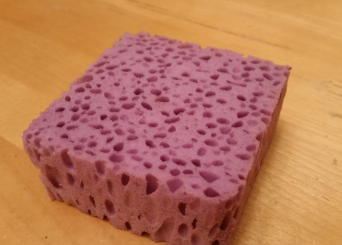 This sponge I used for testing is perforated as you can see. I wanted to test fine details with this application. The level of detail retained from this application was next to perfect. I would highly recommend sponges for your application. You can pick some up cheap and cut them to shape. This will make it very easy to get applied control and maintain shape. I know you are likely looking for more detail oriented designs but for completness sake I wanted to make larger items so I just balled up a napkin to make a heart design. 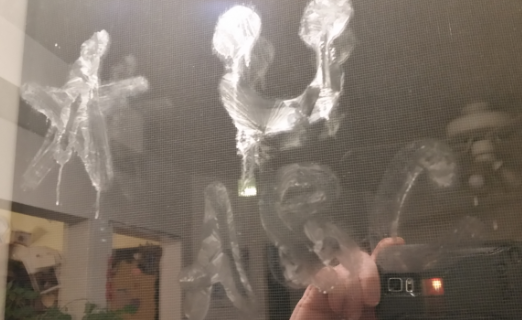 This way my wife should not get made when she sees what I have done to the kitchen windows. This worked as well as I would have hoped. 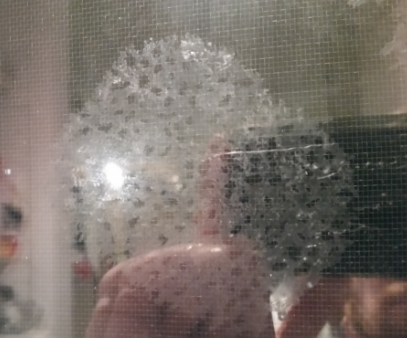 The shape I made is what appeared on the window. It did bleed from the bottom so perhaps too much liquid was used. Easy to clean after the fact though with some water. Much like in the video using fingers would be a useful tool as well. 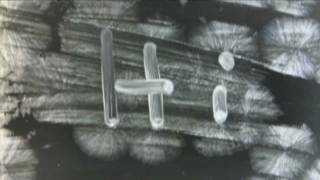 In the video it is shown drawing after the solution was applied to the window. 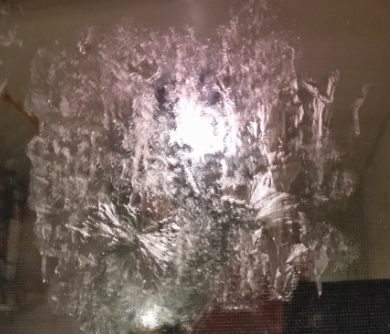 The difference with me is I used my finger to apply the solution to the window surface. Expected results here as well. Design showed well except where some bleeding occurred. I made a happy face which ended up looking more like a horseshoe. Other pictures are a star, the characters A&C and an isometric box (that is not in the picture at all). I recommend the sponge for sure because it helps with easy controlled application. Once you get a feel for the amount of liquid you can easily get the design you want without the salt solution creeping. Not the answer you're looking for? Browse other questions tagged glass or ask your own question. What paint works for “mock” stained glass?